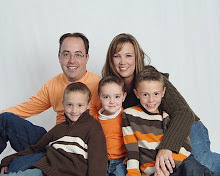 The Kimball Family: Four Boys and a Girl: Do I Really Have a "Spare" Minute? Well, I am making one, anyways. Jax was up every 3 hours and stayed up at 5:30 with a fever around 103 all night (sorry, Laura, I hope the kids are immune by now:(). He is taking a (nice for me) afternoon nap, so it is quiet and the boys are down watching a movie. Eli is being his old Eli self - watching Thomas and Scooby Doo when he can. I am letting them have an afternoon movie because, poor Jonah hasn't done that since Christmas break I think. It is cool out - only in the 40's, so definitely not play outside weather. We bought our tickets to go to North Carolina for a month - June 9th to July 6th - finally. I am so stoked to leave life for a while - now it is just finding subs for my primary class, getting the newsletter done, having gifts wrapped for while I'm gone, etc. 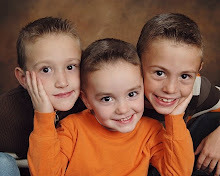 The only sad thing is that Jory will not be coming and will miss Father's Day with the boys and Jonah's 7th birthday. I can't believe he will be THAT OLD - wonder how I'll feel when my baby is 30!! Well, I have ironing and vacuuming to do - I will NOT miss that in North Carolina - that's for SURE!! I'm sorry baby Jax is sick. Hope he is doing better. Congrats to Jonah for his award. Oh how I love the end of the school year when all they do at school is goof off. I am not going to miss homework at all!!!! Poor baby. Both the babies have been sick over here, so they've probably already gone through whatever he has, no worries. I hate it when babies are sick. I can't believe that Jonah is turning 7. Time goes by WAY too fast.